Lincat is one of the world’s leading names in commercial catering equipment, with a range of some 450 products including fryers, griddles, grills, ovens and combi steamers, as well as water boilers, hot cupboards, trolleys and food display merchandisers. When Andrew Brackenbury, Client Manager at Expense Reduction Analysts, originally met Zoë Heywood, Purchasing Manager at Lincat, Zoë had a long list of areas in which she felt savings could be made. Zoë wanted her team to focus on more strategic cost areas, and she felt that they were distracted by trying to manage all of these other categories of peripheral expenditure. This challenge became compounded when she lost one of her team of four staff. 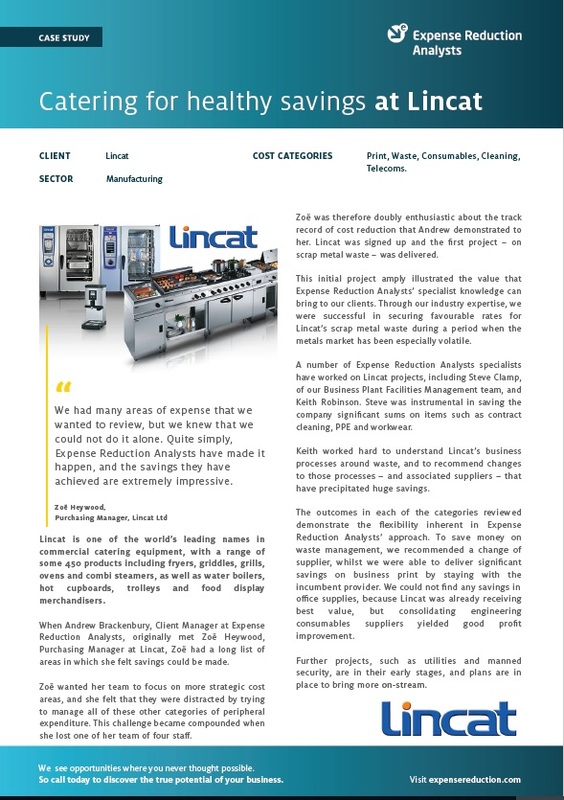 To find out more about how ERA helped Lincat, including results, savings and more details from the client, download the full case study now.